FeastHome – Great! You are planning on decorating your kitchen. That’s a nice move. But, are you a little confused and clueless as to how to do it? Fret not. We are here to help you out. We have listed on some great ideas to decorate your kitchen on any budget. Start by clearing out the space in the kitchen. It is nice to decorate your kitchen, but a cluttered kitchen isn’t good.Throw away products that are sitting on the shelves with no use. Plan something for the unused shelves. You can store cookbooks and recipes there. They are probably online, but a physical cookbook will always come handy and adds a look to the kitchen. 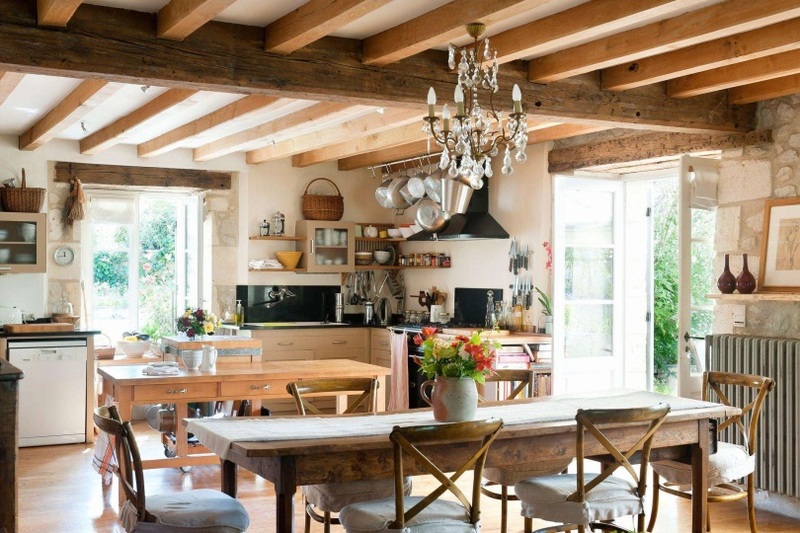 Sketch your idea of a decorated kitchen. Every motive without a plan is a catastrophe. You have to visualise your kitchen and try to eliminate and problems that might arise. Planning is crucial. Sketch the plan, and see if you like it. You don’t have to be a professional artist, a simple sketch will suffice. If you are not convinced, there are so many home planner apps online. Use them. 1. Vertical garden: If you love plants, but don’t have enough space to grow them in a kitchen garden, make a vertical one. Place some pots of tiny herbs on a wall. They will add a layer of freshness to your kitchen. If you are very fond of growing plants try this method. As we know, green plants produce oxygen;it makes our kitchen very fresh. You can grow herbs like mint and plants like lettuce and parsley in the pots. They are also used in cooking asingredients. 2. Paint the cabinets:Giving the cabinetry a fresh coat of paint makes it look elegant and new. Use colours such as grey, lime green and black to improve contrast and brighten your cabinet. Orange and yellow are my personal picks for the cabinet. A new cabinet will improve the ambience of your kitchen. 3. Floating shelves: These are some high style stuff. They add storage to the kitchen while making it look well equipped. We do not recommend this to people with kids and clumsy hands. 4. Hangers for pans and ladles: These look great in your kitchen. It shows that you are well equipped. 5. A crisp-looking coffee maker: Yeah, they are a great accessory in the kitchen. Buy a coffee maker that goes with your theme. If it fits your budget, jackpot! 6. Barstools:These tall tools match your kitchen and welcome people for a quick chat while you cook. 7. Rug: A rug is very useful. Invest in a rug that spans at least 80% of the area of the kitchen. It is better on your feet and your utensils have lesser chance of breaking when they fall. Buy a rug that matches with the colour of the kitchen. Avoid white and any light colours as much as you can. They tend to get dirty very easily. If you definitely need a light-coloured rug, you have to make sure it stays clean. A dirty rug is a deal-breaker. 8. Kitchen clock: Yes, they are a thing. They help you monitor time and go well with the theme. There are so many styles, some with forks and knives, some with plates and ladles. The list goes on and on. You will never be late again. 9. Lamps: Buy cool hanging lamps for the kitchen. They are just awesome. 10. Sofas: Sofas in the kitchen are officially a thing. Waiting for the soup to heat up? Jump in the sofa, grab a book and get cosy while the food keeps cooking. 11. Radio consoles: Why should cooking be long and exhaustive? Turn up the mood by fixing a retro radio console on your cabinet. Put on some awesome music and move to the beat. Cooking just got better. Kitchen decoration is an ocean of possibilities. You can change even a shade of colour and the outcome is wonderful. You can install island-height sofas, put up bar stools of so many colours and even add graphic designs to the walls. These are just some of our ideas. 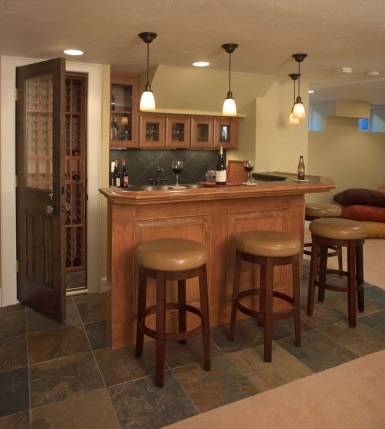 You can install your wine cellar in one side of the wall, or add paintings or even showcase your collections. Do not be afraid to make mistakes. Some of these make your time in the kitchen much easier and joyous. The vertical garden is the best idea to eat your own fresh vegetables every day. 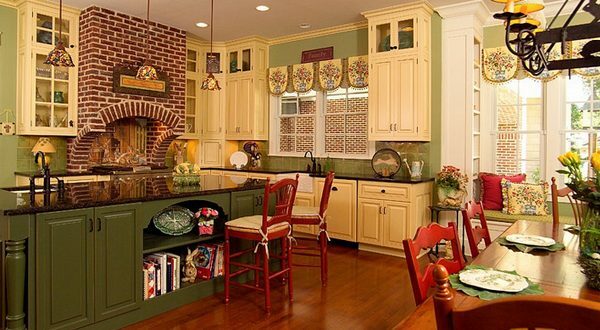 Most fusion kitchens are a result of trial and error, and some are definitely eye catching. Our advice is, do not shell a lot of money on decorations.